Do I have to, really? Okay, let’s just say the writing – now that I’m back to it, post the diary transcription project – is a bit of a slog at the moment. 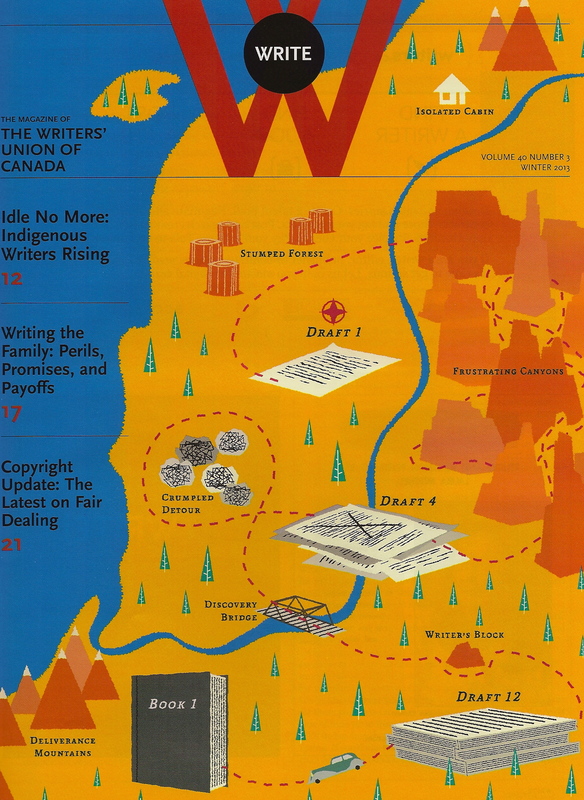 The cover of the latest issue of Write, the magazine of The Writers’ Union of Canada, features a map by Patrick Dias, country unnamed but obviously Land of the Writer. If you’re looking for me, I’m wandering around in Frustrating Canyons, probably on my way to Crumpled Detour. I don’t much like it, actually, when writers sit around and grouse about how hard it is, seeking a kind of exclusivity through their mutual suffering and insecurities. So honestly, no sympathy necessary from non-writers, and as for writers, I know you know what I mean, no need to mention it either. There are these stages, we know this, with variations, and we have to get through them. Still, I was surprised at my inner reaction recently when someone at the early point of a possible writing life asked for conversation/advice. I’m generally happy to provide encouragement, but behind my (hopefully) kind words I was thinking, Really? Why would you want to? Do you have to, really? The thing is, I’d just had a terrific review of my latest book (which I need to mention, of course, though once a book is finished – maybe the truest sign it is finished, in fact – it actually seems like another person’s work), so it wasn’t for lack of affirmation. Plus, because I’ve had a bit of experience by now, I know this is par for the course. To repeat: There are these stages, with variations, and I just have to get through them. As a beginner, I found the Frustrating Canyons much more confounding. I’d hear others say the above, but I didn’t believe it was as true for them as it was for me. And I didn’t want it that way either. I wanted it to be easier. Do you have to, really? Yes, I’m afraid I do. This entry was posted in Books, Writing and tagged Dora Dueck, Patrick Dias, Richard Ford, The Writers Union of Canada, Write by doradueck. Bookmark the permalink. Ah, the struggle—gotta love it. And speaking of which, I loved Ford’s Canada. Glad he wrote it! well if this makes it any better at all, and it may not, i just have to say that every time i read one of your blogs i feel like i have just finished off a good cup of coffee, or fine piece of chocolate. i liked too the quote by richard ford. Oh thanks so much, both of you, Richard and Sarah! Hey Dora, I think my version of that Writerly Map has to have a transparent overlay of Snakes & Ladders. By that, I mean that sometimes I think I have reached Deliverance Mountain, only to suddenly slide down a long slithering beast back to Stumped Forest. Sigh…I’m actually avoiding my writing right this very second. My promise to myself? I will pull up Scrivener as soon as I read a post by Dora and make a comment. Seriously. I pull tricks and carrots like this on myself all the time. I like the idea of a Snakes and Ladders version especially for writers!